The German luxury car maker BMW has launched the all-new BMW 5 Series to attract varied customers with an active lifestyle to personal taste. 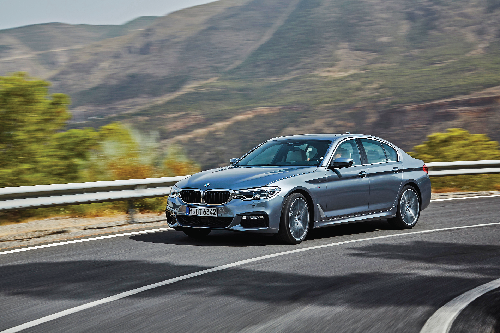 The three diesel variants are the BMW 520d Sport Line, the BMW 520d Luxury Line and the BMW 530d M Sport and one petrol variant is the BMW 530i Sport Line. Calling them the ‘Business Athlete’, they are locally produced at its Chennai factory. I drove the all-new seventh generation 5-Series range-topping the BMW 530d M Sport extensively to check out what it has to offer to a discerning buyer of a luxury car in the country. The luxury car market is dominated by its compatriot rival Mercedes-Benz and others such as Audi, British marquee the Jaguar Land Rover and Swedish Volvo. The first impression one gets on steering the car, undoubtedly, is the driving pleasure and handling prowess the car offers. The 530d M Sport gets an M Sport body kit with a more stylized and aggressive looking bumper. The other design elements like the LED headlamps with the LED DRLs and LED tail-lights are identical to the more affordable 520d trim. Even the grille is wider, if a bit slimmer, and all this together with tighter skinning makes the car look compact. The 530d M Sport sedan runs on 18-inch M light double spoke alloy wheels. The car is 36mm longer, 6mm wider and 2mm taller than its predecessor. Its roof slopes and stretches a lot further forward and rearward so that the bonnet and boot do not appear quite as long and pronounced as they used to earlier. Inside, the ‘M Sport’ it gets an M multi-function steering wheel, comfort seats for the driver and front passenger. As is with almost every modern BMW cars, the dashboard is focused towards the driver. Other features include a sunroof, Nappa leather upholstery, ambient lighting, launch control, auto parking with surround view camera, R/C parking with BMW Display Key and a 10.25-inch iDrive touchscreen infotainment system with Apple CarPlay connectivity and Navigation. While all these features are on offer even in the 520d variant, the 530d in addition to all the above also gets a full-colour Head-Up display, rear seat entertainment screens and an Anthracite headliner. It also offers huge, well-contoured seats with a wide array of adjustments, including bolster width and squab length. Both types of seats are wide enough for big frames and offer soft cushioning and good comfort, but the added bolstering and adjustability in the 530d’s comfort seats offer better support. The back seat too offers generous cushioning from the bench though it appear to be quite flat. Some might also find the backrest a bit too upright, compared to the older car for chauffeur-driven owners, but once you are in place on the move, it is hardly a bother. Interestingly, the BMW’s ‘Hofmeister kink’ signature design feature (the window line angles sharply backward at the C-pillar) makes for a large quarter glass area and a good view out. Legroom too is very good at the rear as is thigh support thanks to a long seat squab, and there is even surprisingly good headroom owing to the scooped-out roof. Because of the spare wheel at the back, which is a must in our market, unlike in Europe, the boot space is reduced to just about 400 litres, which could have been bigger to pack suitcases for family or friends’ weekend stays. The 3.0 litre 6-cylinder diesel engine is based on the modular engine platform, which was first debuted in the BMW 7-Series. To be precise, the all-new 2,993 cc TwinPower Turbo straight-six diesel engine makes 265 HP of power and a massive 620 Nm of torque. That huge torque is available from as low as 2000 RPM and that makes the powerplant very quick and the plus side is that there is barely any turbo lag. This being an aluminium engine, it is quite quiet. As you drive along the highway, you realize it is not noisy at all, all thanks to the metal used inside the engine block. It also shows its impressive refinement levels. In fact, this engine is so refined that it might pass off as a petrol motor sometimes. Higher in the rev range, the powerplant does get vocal but this is not the diesel clatter but a sweet engaging sound. Acceleration in the BMW 530d M Sport is so brutal that it is sure to give a run for its money for cars that cost twice as much. For instance, 0-100 km/hr sprint comes in just 5.7 seconds and it is thrilling. Top speed is electronically limited to 250 kmph. An 8-speed automatic gearbox does the job of sending power to the rear wheels. The gearbox is super smooth as well as fast in shifts. There are paddle shifters offered for you to manually take control of things. The BMW 530d M Sport also gets three driving modes: ECOPRO, Comfort and Sport. ECOPRO gives the maximum mileage while the Sport mode is for an enthusiastic drive. Comfort mode offers you the best of both the worlds. In terms of efficiency, in the ECOPRO mode, the car will return you around 10-12 km/l in the city and around 14-15 km/l in the highway. However, put it in the Sport mode and push it hard, the mileage figures will drop to under 10 km/l. The BMW 530d M Sport remains faithful to BMW's sheer driving pleasure tagline. Though the wheelbase is up by 7 mm, front and rear track are widened by 5 and 3 mm respectively, the luxury sedan weighs approximately 100 kgs lighter than its predecessor due to extensive use of aluminium in the body. The car also feels light on its feet and it is a toy to drive around the corners. It is also stable at high speeds and the grip from the tyres is tremendous. The 530d M Sport gets 245-section tyres up front and 275-section tyres at the rear. Braking performance is supreme and the it grinds to a screeching halt exactly where you want it. The 530d M Sport is positioned as a ‘Business Athlete’ and indeed it stays true to it. With a price tag of Rs 66.20 lakh at pan India showroom, it is not only comfortable and loaded with features but it is fun to drive. There is no point to compare it with any other luxury brand car such as the Mercedes E350d, if you are looking for a luxury sedan for daily commute as well as a formidable Bavarian warhead for weekend destinations, your search could end here. Offering comfortable and plush ride without compromising the fun-to-drive factor, it is indeed a driver’s delight.